Problem on Long Island. Yes There Is Every Year!!! After several decades of relatively little Gypsy Moth Caterpillar activity, these destructive insects are back. Many areas of Long Island have experienced extensive defoliation from the caterpillars during the summer of 2015. 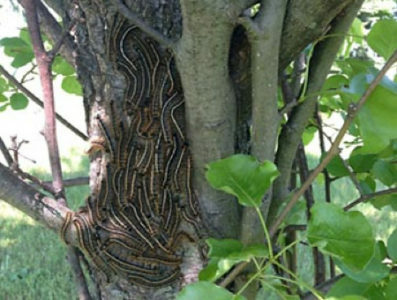 Gypsy Moth Caterpillars are voracious eaters and can make quick work of all the leaves or needles on your trees in a matter of days. YOU MUST ACT QUICKLY!!! Depending on your type of trees and their overall health these insects can potentially kill your trees in 1 to 2 years. At the very least they can cause a fairly healthy landscape to go into severe stress and decline, with only moderate activity. A weakened tree is very vulnerable to disease and fungus. The leaves and/or needles on a tree are very important part to their existence. The leaves provide the tree food through photosynthesis as well as many other functions that is important to their health and survival. Tree damage is caused by the insect larvae, or caterpillars, which hatch from their eggs beginning in early spring and continuing through mid-May. The larvae move to the leaves of trees and begin to eat, mostly at night. During daylight hours the larvae seek shade from the sun but feeding can still occur during the daytime in heavy infestations. As might be expected, a caterpillar’s appetite increases with each shedding of its layers. Feeding continues until mid-June or early July, when the caterpillar begins the pupal stage emerging, finally, as a Moth. Depending on the degrees of infestation by the gypsy moth, tree damage can occur in ranges from light to almost complete defoliation. Most deciduous trees can survive a moderate degree of defoliation, as well many can even survive one complete defoliation by the gypsy moth caterpillar. However, continuous attacks can fatally weaken a tree or leave it vulnerable to other insects or disease. The egg masses are oval shaped and tan in color ( color of burlap) and look like a raised brown bump on the tree. They are approximately ½” long. The caterpillar larvae are about ¼” long and are black in color. As they grow they develop black hairs and colored spots and can eventually grow to 2 ½” long. 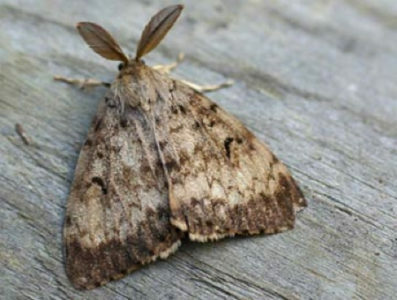 The adult Gypsy Moth appear in mid-summer. The males can fly, have an antennae and are brown. The females are more of a cream color and cannot fly. The gypsy moth caterpillar is not a fussy eater. It has a preference for the leaves of all types of hardwood trees such as maple, elm, and particularly oak. Gypsy moths can also feed on apple, alder, birch, poplar and willow trees. As it grows it will also attack evergreens like pines and spruces. Gypsy moths appear to dislike ashes, sycamores, butternuts, black walnuts and dogwoods and balsams. However, during heavy infestations, competition for food will drive the caterpillar to attack almost any tree or shrub. Depending on the degree of infestation, tree damage ranges from light to almost complete defoliation. Most trees can survive a moderate degree of defoliation. Many can even survive one complete defoliation by the gypsy moth caterpillar. However, continuing attacks can fatally weaken a tree or leave it vulnerable to other insects or disease. 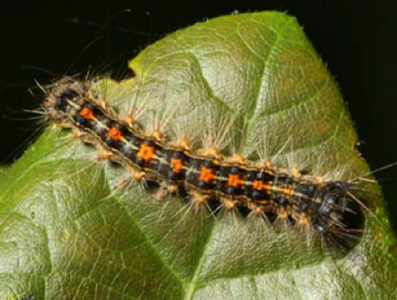 Alternative Earthcare has the most effective Gypsy Moth Caterpillar control techniques available. We begin with a Gypsy Moth Caterpillar Survey and a Gypsy Moth Caterpillar Analysis of your property. We then design the least toxic spray for Gypsy Moth Caterpillar prevention and removal program for your property. These sprays consist of least toxic products like Premetherin which is a man made version of a natural agent produced by the Chrysanthemum family of flowers. It is also crucial that you hire a quality contractor that uses top of the line and state of the art powerful equipment that pumps with pressures that can obtain heights of 100 feet plus, as it is crucial that the material used reached all parts of the tree to obtain maximum results. 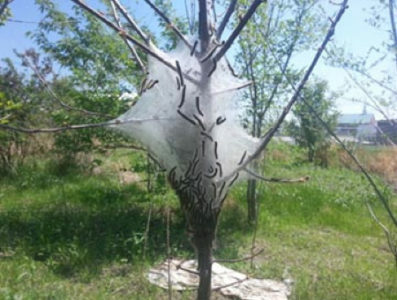 (It does no good to use a lawn care or landscape company that only has equipment that sprays 30-40 feet into the air when you have Gypsy Moth Caterpillars feeding at the tops of your trees). It is important to remember that Gypsy Moth Caterpillars hatch in multiple cycles that can last from 8 to 12 weeks. This is why we strongly recommend a minimum of 3-4 applications approximately 15-20 days apart through the caterpillar hatching cycle. We use a liquid spray application to remove any of the Gypsy Moth Caterpillar problems that exist on your property. With Alternative EarthCare’s services you can be worry free and take back the outdoors for you and your family. The insects will be gone!!! Our Horticulture Sprays are applied every 3-4 weeks for managed insect control of the caterpillars on your property. 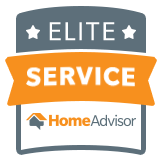 Alternative Earthcare guarantees our results provided you take the program that our expert Service Manager recommends.